I didn’t mean to wait a full year to post, but I think I am glad I did. For many families turning 22 means an empty nest, but not us. Much of this first year has been characterized by a sense of relief for him that not everything is changing at once. I share that relief, wholeheartedly. 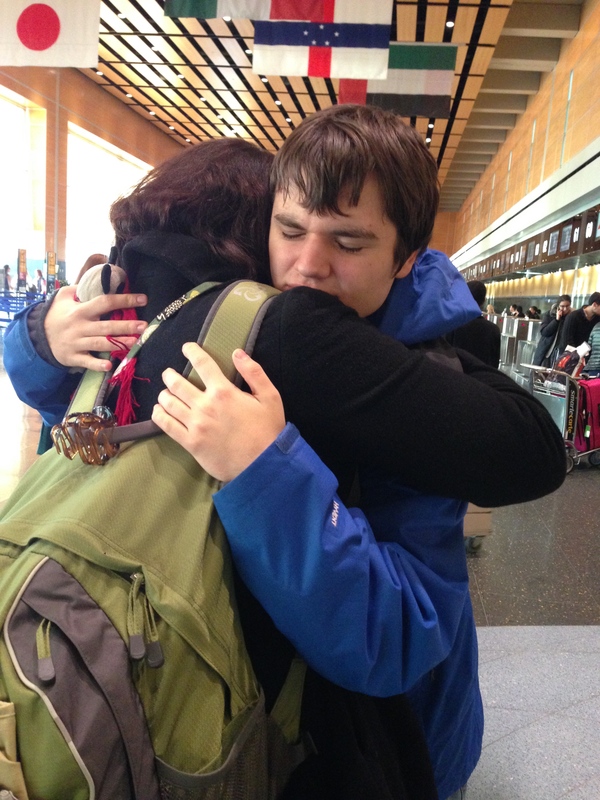 As we prepare for our other children to leave the nest, I am admittedly grateful to know that this man will linger. I understand that we can’t let contentment morph into denial. I also understand that even typical brains aren’t fully developed until age 26 and so extending the transition process beyond 22 means we still need to continually assess the whole person and the whole picture, giving equal weight to the futures of his siblings. Our family is evolving and nothing is truly settled. We are not ready for the long term plan, and if the transition has taught us anything, it’s that planning ahead is an art, not a science. There are few absolutes, and in this political climate we can’t even plan on even the most basic levels of support for our man beyond the family unit. Not for the first time, it occurs to me that I’ve built my life around this family and any personal ambitions I may have had pale in comparison to what has turned into a life’s work: this person who now stands before me, nearly grown. While I try mightily to extricate myself from the lives of my other children, he fits so easily into who I am now that he is in so many ways an extension of me, and I know my husband feels the same way. We, the three of us, are a single symbiotic organism and even when it is maddening it is also plain that I cannot breathe without them. I don’t think it will always be this overwhelming, but it the feeling that we are thriving together instead struggling to understand and survive is shot through with a kind of success that is difficult to describe. That said, one year into the transition we are dealing with only a few of the issues I thought we’d face, establishing social connections and opportunities being the most difficult challenge by far. There’s a bit of waiting for the other shoe to drop, for sure, but the best part is that he is controlling the dialogue. So long ago I prayed for him first to be able to say yes or no, then to tell me if he had a good day, then to outline his fears and desires. I got all of those things and more, even as he remains as vulnerable as a preschooler. I still bask in the miracle of him becoming so much more than I was told we could have hoped – but my hope never waned, and never will. The morning before the last day and, right on cue, the buds are out for the first time this spring. He won’t be 22 for a few more days, but because of the April break tomorrow is his last day in the School District. The week is devoted to community trips to his favorite places – movies, zoos, museums. The staff, like us, seems a little bewildered that this moment has finally arrived. It’s hard to focus on the administrative details and preparation for the next environment; we are grateful to have found a place that not only has meaningful employment waiting for him, but people who are looking forward to his arrival. We may have worked for this outcome but it is still something of a miracle to all of us. There will be challenges, but they are not the kind we can see from here. I see glimmers of anxiety. Last night I asked him to fill out the simple application form for the job training program. he was busy drawing and cast me a sidelong glance, saying, “I’m not very cheery about this.” He complained while filling it out but, as ever, was meticulous about it. Earlier in the day he was putting together a truck given to him by a thoughtful classmate. I watched him pore over the instructions – how many people do you know who follow the instructions from the outset of an assembly project? These gifts, these skills, are integral to his thinking. They will serve him well, always, and will help him make a place for himself in the world. So much more to say, but I’m out of words. Transition does that. It’s January for real. School program is back in session. We wake up in the dark. Without my permission, my mind now looks at every routine as something that will change soon, and weighs whether that is a good or a bad thing. At 6am, everything is a bad thing…except then I realize maybe 6am won’t be the wake up time any more. File that one away. For no particular reason I am glad the Christmas lights are stored away. Nothing more depressing than Christmas lights after Christmas. The phone rings. The driver reports that the street is too icy for the van to come any closer. We can’t even see the van or its headlights. Winter, by New England standards, hasn’t even gotten started yet and we have had more van troubles than even the epic snowstorm years. There’s already been one morning when a crew was required to get it unstuck. It’s considered safer for us to walk down the icy street in the dark than for the damn van to try and make it to our house on our road, which is newly paved but was poorly graded when the street was built. The current driver is risk averse but very nice, and he inches the van into view so his headlights can light the way. The designer of the Econoline van clearly lived in the south, because they could not perform worse in winter conditions and yet we all pile our precious people into them. “A tin can on wheels,” one of our more adept drivers calls them. In previous years we have had braver drivers, better vehicles and a more attentive and skilled plow company. We can only hope that next winter brings better transportation arrangements, but the odds are very much against it. Adult transportation services in semi-rural suburbs such as ours are practically non-existent. It is a bureaucratic and funding quagmire that is legendary among bureaucratic quagmires. I attended a transportation conference last spring that was designed to address just this issue – in the age of Uber and Lyft surely someone is looking at the big picture. Um, not exactly. Regions, cities and towns are coming up with their own solutions, some better than others. Still, the conversations are happening and many experiments are underway. My job is to figure out where our town is in the process and try to move things along, as it were. It doesn’t look like the driveway from hell, but to some it is exactly that. Out and about on this rainy, icy, miserable day, I see an older woman making her way down a treacherous sidewalk. She is wearing a heavy wool coat and has a plastic rain scarf on her head, the kind that unfolds like an accordion. She’s pushing a wire shopping basket. I feel guilty zipping by in my warm car as she bumps along, and I wonder how people find themselves so suddenly in her shoes, in the rain, in the cold and it strikes me that I know exactly how that happens and that this is why I am obsessed with the transition. But this particular person strikes me for another reason. Even though I cannot see her face, I have known and been curious about women like her – kind, patient and determined. I think of one from my childhood in Iowa, Evelyn, who was a nurse who survived the Bataan Death March in 1942. She haunted the back of our church and brought our family bags of walnuts she had gathered from her yard. When the Beatles released Eleanor Rigby, my mother said the song reminded her of Evelyn. She is one of so many people I wish I had been brave enough to know better. In the meantime, I resist the urge to ask my teenaged companion if he wants to live in this town forever (I know that answer anyway), if and when we should sell the house, and whether he really needs to go away to college. For once I am grateful for the Metallica blasting from his earbuds. Breathing deeply, I remind myself that we can only make one decision at a time (mostly) and that no decision can or will last forever, so I should stop planning for decades and settle on planning for months. I’ll never stop thinking about the decades but for now just getting home and having lunch will have to suffice. Getting home and having lunch. Sounds like a routine we can keep. Christmas is over; time to move on. And so at last we embark on the year of Turning 22. This is a moment for which every parent hopes. It is beginning to dawn on me that it marks the first of many role reversals between us. There are many people who advocate for autism awareness and acceptance better than I. As another April rolls around and so many campaigns go forward to integrate autism into our collective consciousness, I find that my greatest impulse is to share my undying admiration for my ASD son, who is growing into a delightful man. He is mercurial, goofy, meticulous, and single-minded. He is sensitive, intuitive, impulsive, and hyper-empathetic. He worries about death, separation and growing up. Most of all, he is vulnerable. He is aware of a complex world in which many things are just beyond his reach and so craves sameness and routine. He wants those he loves to be always near him. The heavy mantle of trust he places on us is never a burden because within it is his precious heart that gives love so freely it makes us dizzy with delight. All his emotions are distilled down to their purest form, and there are moments when I am temporarily daunted and disarmed by the intensity. He is, I have understood for many years, the embodiment of the greatest joys and fears of all humans. He is the precious natural resource we have been charged to preserve. We are honored by the task and hope to be worthy of it, and of him.